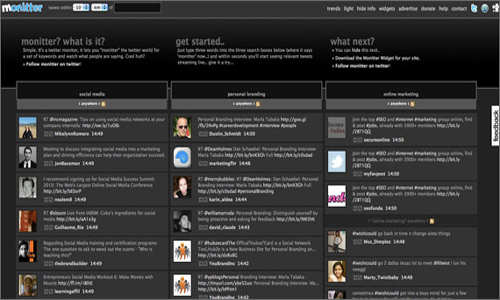 Monitter is one of the Twitter tracking tools reviewed below. This is part of our ongoing series on how organizations can get the most out of Twitter. Please see below for other installments in this series. People are talking about your nonprofit, especially on Twitter. Research shows that one out of three Twitter users talk about brands in their tweets. You don’t have the time to moniter your organization’s Twitter stream all day long, hoping to catch any mentions of your name. Thankfully, it’s easy to keep an eye on your brand. You can save time by setting up the right tools for your Twitter account. Below you’ll find plenty of options for monitoring mentions and tracking keywords so that you can respond to supporters promptly and analyze your results for success. 1Twilerts is a brand application that enables you to receive regular email alerts of tweets containing your brand, or whatever keyword you want to stay on top of. Think Google Alerts for Twitter. It allows you to track up to 10 queries, using its basic or advanced options, after creating a free account through your Twitter account or through Gmail. 2PeopleBrowsr is a Web-based search engine for real-time conversations. The possibility to search bios and tweets by authority, location and links are among its Twitter features. But this is only the beginning, as this tool provides you with plenty of more options to keep track of your brand. It will even analyze tweets and classify them as positive or negative and track sentiments overtime. PeopleBrowser also offers full social analytics solutions with the ability to monitor Facebook, blogs and forums. With pricing beginning at $149 per month per seat, this is clearly an option for power users who really want to go deep with their tracking. Interestingly, the company announced last month that it’s offering a new service called Kred as a competitor to Klout. 3Sideline is a free monitoring tool from Yahoo! that lets you specify keywords to keep track of via an attractive downloadable app. It runs on Adobe AIR and is open source (though Yahoo! sticks an odd “all rights reserved” notice at the bottom). Sideline has advanced search features, including auto-refreshing of search queries and scanning trending topics. It also offers an Influencers tool to watch what important people are saying about a topic. Watch a four-minute screencast at Vimeo. 4SocialMention lets you search keywords on Twitter; however, it also looks for mentions on 100+ social media properties. Place widgets of tracked searches on your website or create daily email alerts for searches. You can only search for one keyword at a time, although you can set up more than one alert. The dashboard, however, goes beyond only searching for your keyword; it also shows you sentiment, top related words, top users and top hashtags. 5Twitter offers several free tools which can help you keep track of what’s being said of your brand. The ability to create Twitter lists can be hugely helpful if you keep them organized. Third-party apps, such as Hootsuite and Tweetdeck, make viewing lists easier. With the advanced search options, you can monitor negative impressions, questions and tweets by location.